3d Concept Of Golden Chess And Money PowerPoint Templates And PowerPoint Themes 1012-Develop competitive advantage with our above template which contains a diagram of 3d golden chess players and money along with it. This Template signifies the concept of playing chess as a means of money. Clarity of thought has been the key to your growth. Use our templates to llustrate your ability.-3d Concept Of Golden Chess And Money PowerPoint Templates And PowerPoint Themes 1012-This PowerPoint template can be used for presentations relating to-"Golden chess and money, business, finance, money, signs, communication" Our 3d Concept Of Golden Chess And Money PowerPoint Templates And PowerPoint Themes 1012 are conveniently detailed. They afford you the ease and comfort you deserve. 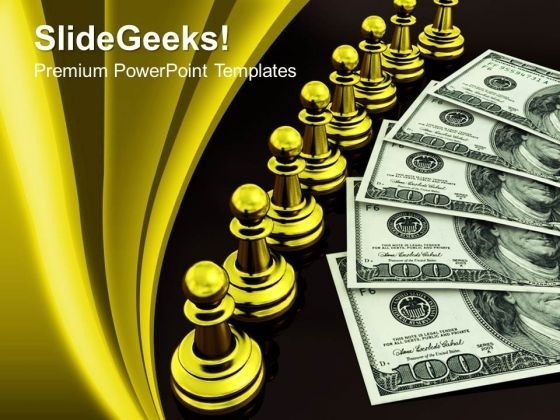 Have some fun with our 3d Concept Of Golden Chess And Money PowerPoint Templates And PowerPoint Themes 1012. They make creating ideas enjoyable.